Keep an open eye in Panama and you might just see a Panamanian Golden Frog. Local legend used to promise luck to anyone who spotted the frog in the wild and that when the frog died, it would turn into a gold talisman, known as a huaca. Nowadays, you’ll see the frogs on decorative cloth molas made by the Kuna Indians, on T-shirts, as inlaid design on a new overpass in Panama City and even on lottery tickets. 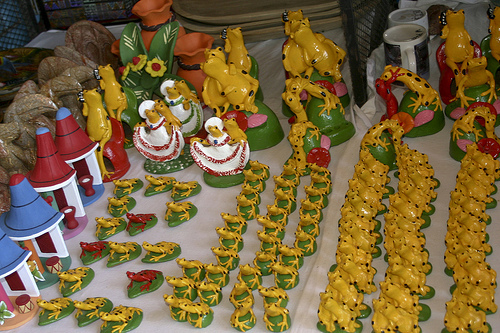 In the market at El Valle de Antòn, you will see them by the thousands either as enamel-painted terracotta or on hand-carved tagua nuts. The one place you probably won’t see a Panamanian Golden Frog, however, is in their native home—the crystal clear streams of the ancient volcanic crater of El Valle de Antòn. In the mountain forests you may spot other similar-looking extant species such as Atelopus varius, but the only local and true Panamanian Golden Frogs Atelopus zeteki are those breeding in captivity at the El Valle Amphibian Conservation Center (EVACC) at the El Nispero Zoo. 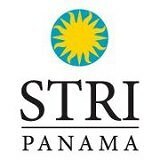 In the early 2000’s conservationists warned that this day-glo yellow emblem of Panama was in grave danger of extinction. 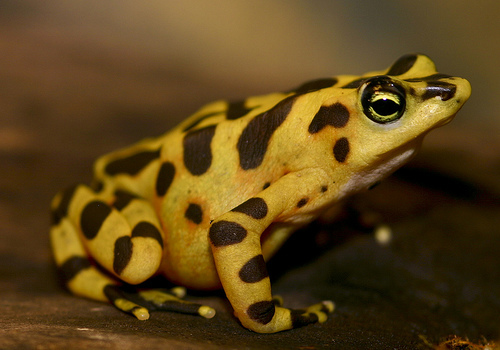 In emergency response, Project Golden Frog was established to create captive assurance colonies of this species, just in case the scientists’ worst fears came to pass and the species went extinct in the wild. In 2006, just as the scientists had predicted, the chytridiomycosis disease hit El Valle. The Panamanian Golden Frog—whose populations were already under pressure due to collectors and habitat loss—was decimated. Suddenly, Panama’s unique harelquin frog species joined the ranks of at least 30 other harlequin frogs that are most likely extinct in the wild. Luckily, Panama’s charismatic namesake was part of an AZA Species Survival Plan. Today, the captive population is being carefully managed and bred for long-term survival by a number of zoos and aquaria in the United States and Panama. The animals in these assurance colonies have served their intended purpose and provide an insurance policy for the species, guaranteeing that this important Panamanian cultural symbol will never be lost all together. A tragedy has thus been averted. Instead of a dire warning of the future fate of the planet, Panamanian Golden Frogs are now a symbol of hope. Exiled frogs are playing the role of a flagship species, bringing the story of global amphibian declines to world wide audiences in zoos and aquaria, magazines and films. 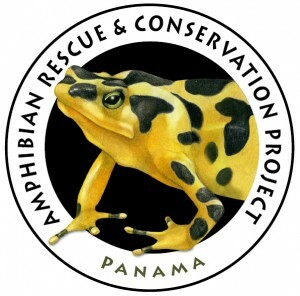 As the logo of the Panama Amphibian Rescue and Conservation Project, the Panamanian Golden Frog is a powerful symbol uniting 8 key institutions. Together, we have embarked on this ambitious national program to build capacity at the Summit Municipal Park in Panama and to create assurance colonies of other amphibian species from Eastern Panama before it is too late. We are also actively working with some of the world’s leading researchers like Reid Harris and Louise Rollins-Smith to develop a cure that will allow us to control the further spread of chytridiomycosis. Our great hope is that one day we may re-establish wild populations of Panamanian Golden Frogs back into their rightful home in the streams of El Valle. Until then, we embrace Panama’s living gold as a symbol of hope and achievement in showing us how we can preserve Panama’s amphibian biodiversity.